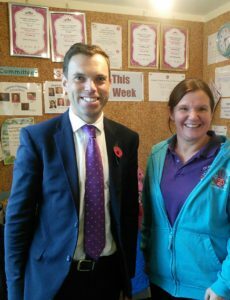 Assembly Member Ken Skates visited a nursery to hear about the difference a new Welsh Government scheme is making to parents. 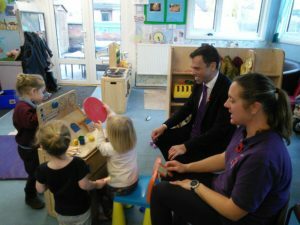 Childcare providers in Bronington, Brymbo, Coedpoeth, New Broughton, Overton and Ponciau are among those in Wrexham to have benefited from the programme since September. It provides 30 hours of early education and childcare to working parents of children aged three and four for 48 weeks of the year – the most generous childcare package anywhere in the UK. Overton Playcentre is a parent-led charity which has been running for 50 years and currently relies on volunteers to raise nearly £7,000 a year to cover running costs. It was recently awarded £8,200 in National Lottery Awards for All funding to develop an outdoor learning area.